The International Olive Council (IOC) in Madrid, Spain, sets the grades and standards for world olive oil trade, which members of the North American Olive Oil Association agree to follow. The different types of olive oil are distinguished by their production method, flavor and chemistry. For production and trading purposes there are six different grades of Olive Oil and three different grades of Olive-Pomace Oil, although consumers are usually offered only two or three types for home or restaurant use. 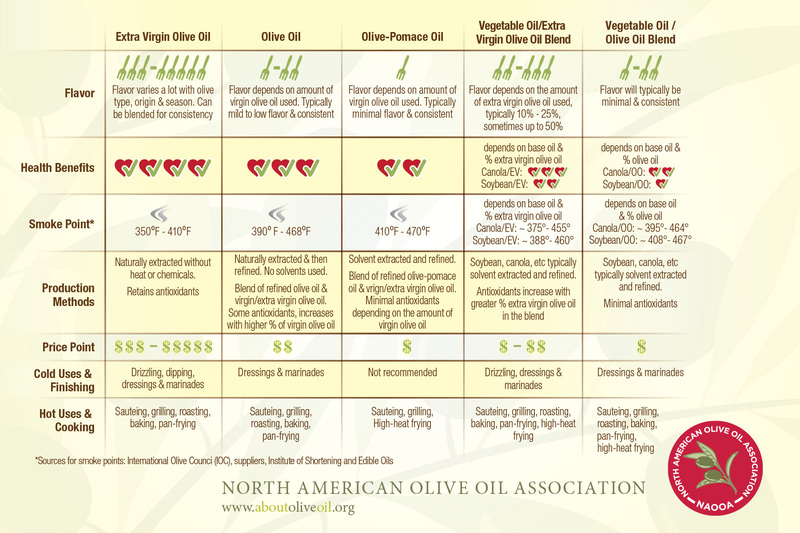 All olive oils offer benefits compared to commonly-used cooking oils, but the health and usage benefits vary among the grades. The closest to nature are Virgin Olive Oils, which offer the most health benefits and a wide range of quality and flavor profiles, similar to wine. The flavor profiles of Virgin and Extra Virgin Olive Oils are vast. The final flavor is affected by many factors including the olive type, where the olives are grown, when the olives are harvested, the weather during the growing season, and the processing. Poor quality virgin olive oil with major sensory and/or chemical defects is called Lampante olive oil. Lampante olive oil is refined to remove bad flavors and odors and the end result is Refined Olive Oil. The grade Olive Oil is made by blending Refined Olive Oil with Virgin Olive Oil. The Virgin Olive Oil adds flavor and antioxidants back to the Refined Olive Oil and the percentage used can vary by supplier. Finally, the IOC sets standards for a separate product category called Olive-Pomace Oil. Unlike Olive Oils, which are naturally extracted from olives, Olive-Pomace Oil is solvent extracted from the leftover skins and pits after the olives are crushed and then it is refined. The consumable grade Olive-Pomace Oil is made by blending Refined Olive-Pomace Oil with Virgin Olive Oil.